(4) Piton Carabiner Method. Not all pitons can be used for this technique due to some pitons being designed with sharp edges. Shallow angle pitons work the best. (§) Place a locking carabiner into the hard point on a harness. (b) Clip another carabiner with a piton attached through its eyelet to the other carabiner already attached to the hard point. (B) Take a bight of the rope through the outer carabiner. (d) Place the piton beneath the bight so its pointed end rests on the opposite side of the carabiner it is attached to. (§) The rope then runs across the top of the piton. (f) To brake, pull the rope forward causing a bight around the rope and the piton. TRANSITION: Now that we discussed alternative belays, let us talk about alternative anchors. The Cordelette Method. This method is good because sometimes the extra 10 or 15 feet of rope may be required to get to a better belay stance. It requires a 16-foot Type II cordage that is constructed into an endless loop. ^®Place three pieces of protection with carabiners attached. )Clip the Type II cordage into all three pieces of protection ensuring that the joining knot is located near one of the carabiners so that it will not be involved in the system. )A bight will be pulled down between each of the pieces of pro so that there are three equal bights pointing in the anticipated direction of pull. 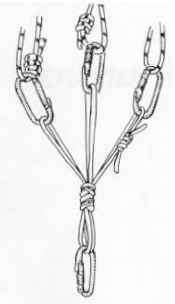 Tie an overhand knot at the end of the bights creating three separate equalized loops. )Clip a carabiner these loops. 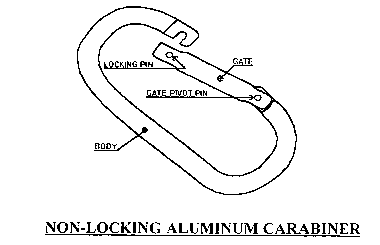 This carabiner will now serve as the main anchor point carabiner to the constructed system. An additional carabiner that will serve as the main anchor point carabiner is clipped on the bottom of the hanging runner. 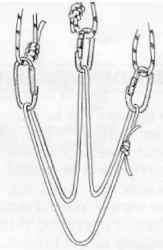 (2 The runner is grasped between each anchor, twisted 180 degrees, and clipping each resulting loop into the main anchor point carabiner. Such twists guarantee that the main carabiner is clipped into, and not around the runner, so that it will stay attached to the runner even if two of the three points fail. (3) The smaller the runner the smaller the drop if one anchor fails. Therefore, if the anchors are wildly separated bring them together with other slings before equalizing. Special Considerations for Belay Stance Anchors. To safe guard the #2 from possible hazards i.e. belaying from a ledge, waves from the sea during amphibious assaults, etc., two pieces of protection will be placed in the direction of pull while the third will be place in the opposite direction of pull. lace the three pieces of artificial protection keeping in mind the anticipated direction of pull if the lead climber fell. )The belay stance will be constructed in the manner as taught in BELAYING FOR PARTY CLIMBING. TRANSITION: During this period of instruction we have talked about various alternatives to belaying and anchoring. Remember safety is paramount and only use alternative methods if all other methods have been exhausted. How to tie an equalizer for climbing?